Here is a list of titles that I consider indispensable reading for people who plan special events and ceremonies and who welcome VIP and international guests on campus. These books belong in every campus event planner’s office to serve as quick references when deadlines must be met. They are also excellent reading for newcomers for whom little formal onsite training may be available. Academic Ceremonies A Handbook of Traditions and Protocol, by April L. Harris. A reference for commencement, convocation, the meaning of academic symbols and how to use them. Includes suggested ceremony line-ups. Choosing Civility, The Twenty-five Rules of Considerate Conduct, by P.M. Forni. Food for thought about why what we do every day is important in making our world a more pleasant place. Disability Etiquette Matters by Ellen L. Shackelford and Marguerite Edmonds. An excellent quick reference for interacting appropriately with people with disabilities. Emily Post’s Etiquette, 18thedition, Manners for a New World, by Peggy Post, Anna Post, Lizzie Post, and Daniel Post Sending. A contemporary resource for general etiquette questions. 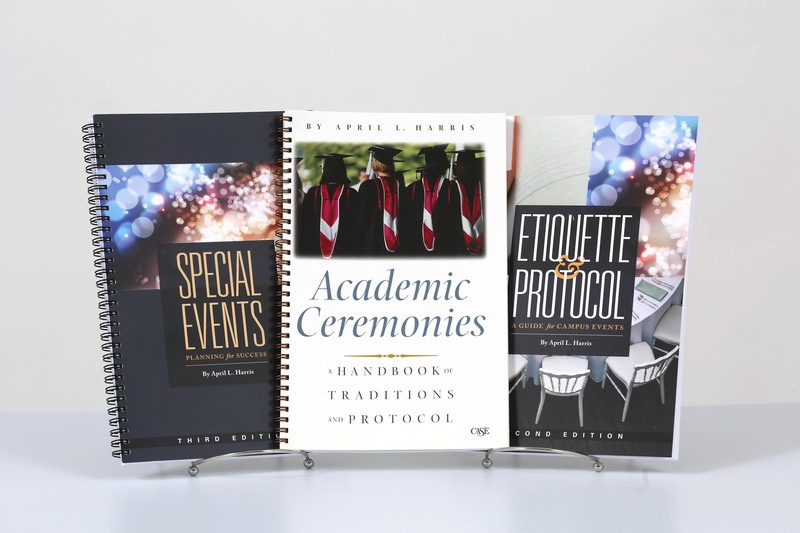 Etiquette and Protocol A Guide for Campus Events, 2ndedition, by April L. Harris. A quick reference for answers on the questions campus events planners encounter everyday including academic forms of address, symbols of office, and faculty colors. Event Leadership for a New World, 4thedition by Joe Goldblatt. An excellent textbook that teaches everything from strategic planning to managing contracts. Honor and Respect, The Official Guide to Names, Titles, and Forms of Address by Robert Hickey. This is the definitive reference on proper use of names and titles around the world. Our Flag, a U.S. government publication available either online or for purchase at bookstore.gpo.gov. This pamphlet is an excellent, accurate reference for U.S. flag protocol with an interesting section about the history of our flag. Protocol The Authoritative Source, 35thAnniversary Edition, by Mary Jane McCaffree, Pauline Innis, and Richard M. Sands. More detailed than most of us need on the average day, but if you are hosting government and military officials, or need to ensure flags are appropriately displayed, this book is essential. Robert’s Rules in Action: How to Participate in Meetings with Confidence, by Randi Minetor. A great quick reference for the situations encountered in all but the most formal meetings. Robert’s Rules of Order Newly Revised, 11thedition, by Henry M. Robert III, Daniel H. Honemann, and Thomas J. Balch. This is the bible of parliamentary procedure for formal occasions like board of trustees’ meetings. Special Events Planning for Success, 3rdedition, by April L. Harris. A how-to reference for creating effective events on campus including a discussion of why events are important for advancement. Treating People Well, The Extraordinary Power of Civility at Work and in Life, by Lea Berman and Jeremy Bernard. A fun and inspiring read from two former White House social secretaries. World Wise What to Know Before You Go, by Lanie Denslow. A primer for cross-cultural interactions, especially helpful for people who have never travelled overseas and useful to raise staff consciousness about cultural differences when welcoming delegations from other countries. The annual meeting of the North American Association of Commencement Officers (NAACO) just wrapped up. It was three days of shared ideas, access to resources, and making connections with other people who do the same work. 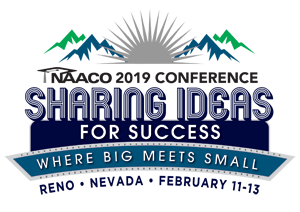 We heard from subject matter experts, swapped ideas, told war stories, learned about best-practices, and participated in provocative, motivating sessions designed to dislodge us from our ruts and push us to rethink business as usual. For people who work in the niche world of academic ceremonies, rubbing shoulders with others who do the same and listening to authoritative presenters can be a font of useful how-to information and a confidence-building validation of our own practices. We left feeling refreshed, heads swimming with ideas and phones filled with new contact information. We also made connections with quality vendors who are themselves subject matter experts, and who offer tools that can make our jobs easier. I believe that all employees should attend at least one annual professional meeting. Nothing grows committed, creative, motivated, and effective employees more quickly than signaling that you respect them enough to invest in their continuing education by sending them to a conference. Attending a conference is not only mentally rejuvenating, it is the most efficient and cost-effective way to update employees about the latest thinking in their specialty areas. Without this infusion of new information and ideas you and your staff are simply talking to each other in a stale echo chamber of “that’s the way we’ve always done it.” By staying home, you miss developing a network of colleagues with whom you can consult to solve problems, or whom you can call to celebrate success. Contact with professionals from other schools keeps us fresh through the cross-fertilization that can only come from listening to others who work in our field. Attending also keeps us abreast of learning about new tools and technologies that help us all do a better job for our schools. Being an active member of professional organizations has added a dimension of quality and satisfaction to my professional journey that cannot be overstated. Protocol and Diplomacy International-Protocol Officers Association (PDI-POA). Traditionally, most PDI-POA members came from military or diplomatic backgrounds but in the past eight years, academic event planners have been the fastest growing segment of this organization’s membership. Collegiate event planners have been welcomed into the fold because we often host people and occasions that demand observance of protocol. It is necessary that we understand customs and expectations for everyone from government officials, military officers, famous authors, scientists, artists, celebrities, and international visitors and imperative that we understand their customs and expectations. Because the group’s members hail from all over the globe and include leading experts and authors on all aspects of protocol, PDI-POA is an excellent resource. PDI-POA hosts an annual forum and also offers regional workshops. Membership is particularly beneficial for people who plan president’s or chancellor’s events, who handle VIP and dignitary events, and special events planners who field a wide variety of ceremonies and occasions from every corner of campus. Protocolinternational.org. 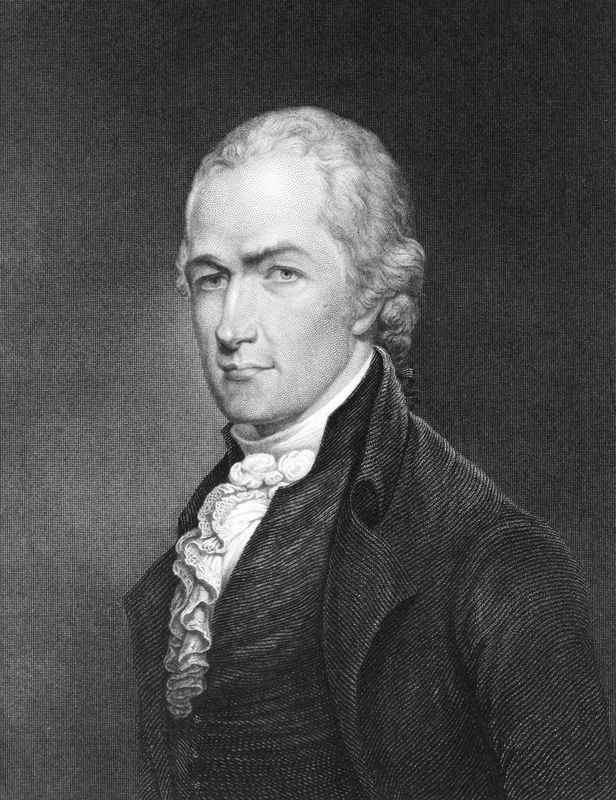 Even though he died in 1804, Alexander Hamilton is going to receive an honorary degree from Albany Law School at the college’s spring commencement. Honorary degrees, higher education’s most prestigious recognition, are reserved for eminent individuals with national or international reputations. Hamilton certainly qualifies. He was one of the nation’s founding fathers, had a distinguished career as one of George Washington’s most trusted aides during the Revolutionary War, later practiced law, served as the first secretary of the treasury, and is considered the father of the nation’s financial system. Why now? Honorary degrees are an opportunity to establish ties with a prominent person, to bask in the reflected glory of his or her accomplishments, and to generate some positive media buzz. In Hamilton’s case, Albany Law School said it is recognizing his contributions to the Albany, New York area where he practiced law and married into a prominent local family. With Hamilton currently riding a wave of rock star status thanks to the Broadway musical that bears his name, tiny Albany Law, an old, private school with only 372 students, is riding his coattails with a creative local angle that has brought an enormous PR bounce. Hamilton never actually earned a law degree, so awarding him an honorary is the perfect way to call attention to the school. Honorary degrees don’t typically get much publicity, but this announcement has generated extensive media coverage. So how can a guy who has been dead for 214 years qualify for a degree? Honorary degrees are conferred honoris causa, a Latin term meaning “for the sake of honor.” They are typically doctoral degrees, though not equivalent to Ph.D. s, nor do they entitle the recipient to the same professional privileges as individuals who have earned degrees. Honorary degree recipients are leading scholars, discoverers, inventors, authors, artists, musicians, entrepreneurs, social activists, and leaders in politics and government. Occasionally, honorary degrees are awarded to people who have rendered lifelong service to a university through board membership, volunteerism, or major financial contributions. At some schools, honorary degree recipients deliver the commencement address, but this is not a requirement. Honorary degrees are often presented at commencement to take advantage of the large audience and the pomp and circumstance already in place. The candidate is part of the platform party and processes wearing a black doctoral gown or the school’s custom doctoral regalia. Candidates are hooded and receive a diploma and a citation. In the case of a posthumous degree like Hamilton’s, a surrogate stands in to accept these items. Honorary degree recipients are properly addressed as “doctor” in correspondence from the university that awarded the degree and in conversation on the campus. But honorary degree recipients should not refer to themselves as “doctor,” nor should they use the title on business cards or in correspondence. The honorary degree recipient is entitled to use the appropriate honorary abbreviation behind his or her name, for example, (full name), Litt.D. On a resume or in a biographical sketch, they may indicate an honorary degree by writing out the degree followed by the words honoris causa to signify that the degree is honorary, not earned. Because many people misunderstand these nuances, it is courteous to provide recipients with a card or brochure to explain how to appropriately signify their degrees. Tuck the card in with the hood and citation when these items are shipped to them after the ceremony or send in a follow-up congratulatory letter. So, while I don’t know for certain, my guess is Alexander Hamilton will receive a Doctor of Laws (L.L. D.) and were his ghost to ever to appear at Albany Law School, it would be correct for all there to address him as Doctor Hamilton. Back in his New York City law office, however, he would be just plain Mr. Hamilton. For more information about honorary degrees, including presenting the degree, awarding it posthumously, regalia for the recipient, and how to appropriately host the honoree, order my book Academic Ceremonies A Handbook of Traditions and Protocol, available at http://case.org. Hotels and airlines have one thing in common: They seat people too closely together. People, especially Americans, don’t like to be pressed together with body parts touching, and definitely not when the contact involves a stranger. Yet, prevailing meeting management does just that. I just spent the afternoon in a jammed hotel conference room with 100 other hot and uncomfortable souls. Why? Because the chairs were “ganged,” that is, locked together in long straight rows. We were sardined in to a tiny partitioned hunk of a much larger ballroom with no less than 30 hot can lights blazing down on us throughout the hour- and one-half presentation. I had my shoulders scrunched together to stay in the 18-inch boundary of “my” space and couldn’t have crossed my legs if I tried because the space between the rows was too narrow. By the end of the session the audience, dressed in winter business suits and sweaters, was sweating and fanning. It must have been 83 degrees in there. The presentation was standing room only, but a closer look revealed there were lots of empty seats scattered throughout the room. That is because people would rather stand than crawl over a row of others to shoehorn themselves into a too-small vacant seat. Scattered vacancies demonstrate that people instinctively leave blanks to create a more appropriate boundary between themselves and others. We need our personal space in order to relax, listen, and concentrate. 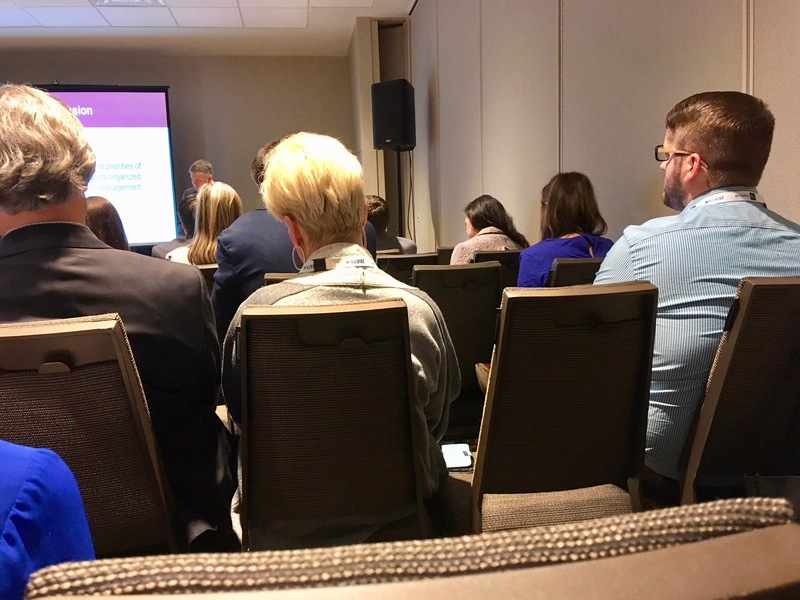 Claustrophobic seating makes grumpy participants who want to leave—the exact opposite of the mood event planners strive to create. Seating is an important and often overlooked factor in the success of a meeting or event. If people can’t see and hear, if they are crowded, feel trapped, and can’t get out to use the restroom, effectiveness suffers. If you can’t think about anything except how uncomfortable you are it is difficult to pay attention. What’s more, jammed seating can be a safety hazard. Beyond the possible violation of fire code capacities, meeting safety demands that people be able to access aisles and get to exits without tripping over chairs. One safety expert has noted that because interlocking “ganged” seats are heavy, cannot be easily separated and quickly moved away, they become an added hazard in an emergency situation when the difference between life and death could be the ability to rapidly exit a space. Comfortable seating begins with selecting a right-sized room. Better to have a space that is slightly larger than needed than to cram people into a room that is too small. First consider what the audience needs to do. Are tables required to hold computers or will participants be seated theatre style in rows of chairs? Are you planning a board meeting, or will everyone be watching a webinar? The meeting’s purpose and length should always drive the room arrangement. Check out the chairs. Are they in good condition, not wobbly, clean, and comfortable to sit in for an extended time? If a theatre style scheme is needed, arrange the chairs with four inches between seats rather than allowing them to touch. Instead of putting them in a straight line, encourage better audience interaction by using a curved arrangement which lets people watch the speaker and see the screen without turning their heads. It also allows them to see each other, thus stimulating discussion. Paul Radde, the meetings industry seating guru, explains in his must-have book, “Seating Matters State of the Art Seating Arrangements,” (thrival.com), that a curved arrangement can actually increase the number of chairs that will fit. Next, instead of creating long rows that are difficult for people to enter and exit, cut the semi-circle into pie shaped wedges by creating several aisles. This way, people can get in and out of seats with much less difficulty. Make the rows as short as possible. Another tactic to try is ditching the commonly used center aisle and instead separating seating into three groups, a center section and two side sections, with two aisles separating the sections. This allows shorter rows and easier access. Why leave that prime middle of the room real estate, the space with the optimal viewing angle, empty? A critical comfort measure is the spacing between rows. It should be at least 17 inches though many hotels will use only the 12-inch minimum required by many states’ fire codes. Rows that are too close together create the “knees in the chin” feeling that we all experience on airliners. To check spacing, use a tape measure beginning at the front edge of the chair bottom and stopping when it touches the top of the back of the chair in the next row. Ensuring a comfortable amount of leg room also creates space for people to place personal belongings such as tote bags and back packs on the floor without blocking the aisle. Wider spacing is imperative when your guest list includes older people. Philosophically committing to use more comfortable room arrangements will likely be easy. Getting set-up crews (especially in hotels) to honor your requests may be another matter because they are trained to squeeze for maximum seating and to create tight, straight rows with touching chairs. Begin by issuing clear instructions including an illustration. On campus, plan to be present when set-up is being done. At a hotel or conference center, chances are the set-up will happen after-hours when you are not present. Be certain your hotel sales representative knows your plan because if you have not provided clear instructions, arrive and want furniture to be rearranged, you will probably be charged a penalty unless you can substantiate that your instructions were not followed. Provide two copies of your illustration, one for the sales representative, one for the set-up crew. Once you’ve got seating arranged, adjust the room temperature to 69- to 70-degrees, depending on the season and what guests will be wearing. A 69-degree room when people have on business suits may be fine, but on a hot summer day when people are wearing lightweight clothing, 69 may feel chilly. Finally, turn down the glaring recessed ceiling lights, pick a seat and enjoy a comfortable, productive meeting! A major public event that attracts a large attendance, includes dignitaries, or that has historic, political, or religious significance may be designated by the Department of Homeland Security as an NSSE. Many of America’s marquee events that could be attractive targets for terrorism or other disruptions fall into this category. Typically, such events are of a size and scope that is far beyond the scale of local resources. A NSSE determination is based on a SEAR (Special Event Assessment Rating). This system assesses threats and incorporates a risk analysis and then ranks the event on a 1-5 scale, with 1 being the highest priority. Super Bowl is definitely a SEAR 1 event. Once designated an NSSE, federal and local agencies work together to construct a security plan that covers everything from traffic and crowd control to hotel security, tactical units, communications, volunteers, evacuation plans, access, and much more. Work is done in committees. The Minneapolis Super Bowl Host Committee and Minneapolis Police Department have been working for two years in conjunction with federal agencies to develop security plans including snipers on rooftops and the largest influx of federal agents in Super Bowl History. 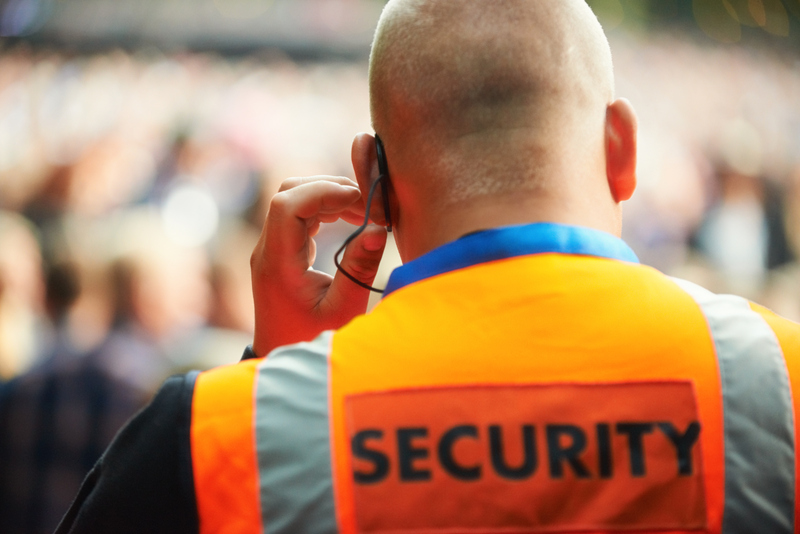 Most guests will never see the extra layers of personnel and resources assembled to keep them safe but security personnel and systems will be everywhere. Campus event planners need to be aware of what constitutes an NSSE because we frequently host events that might qualify. Occasions such as presidential debates, visits by international leaders or religious officials such as the Pope, or high-profile sporting events like an NCAA championship game are all candidates. An NSSE’s heightened and complicated security arrangements are not business as usual meaning that we need to learn how to appropriately engage in security planning. Security on such a massive scale forces planners to give up some autonomy and requires that we cannot adjust plans at the last minute (as we often do) without first conferring with those in charge of security. Recently, a group of lighting professionals were working at an NSSE. The crew had been instructed the night before by the event planner to dress in show black without logos, bring their backpacks, and set up underneath the bleachers inside of the secure perimeter. The problem was, she never told security officials of her last-minute directive. While the crew were waiting in the designated place, an officer spotted the unknown men and an alert went up the chain of command. Security quickly responded, detaining the men while an investigation took place. The situation was soon resolved but it was unnerving to reflect on the fact that the men had been in the sights of snipers. The moral of the story is, during an NSSE, event planners are no longer the final authority but part of a much larger team. We must be forthcoming with information, be aware of the potentially dangerous consequences of our decisions, and be fully engaged in planning and briefings. Attend briefings as appropriate so you know what’s going on. Fall Convocation, one of the happiest days on the academic calendar, is in the books for 2017. Held the night before classes begin, the purpose is to affirm each student’s decision to attend the university, to begin to transfer school traditions, and to build pride. Like many southern schools, ours takes place outdoors, never mind that late August is almost always oppressively hot and sticky. 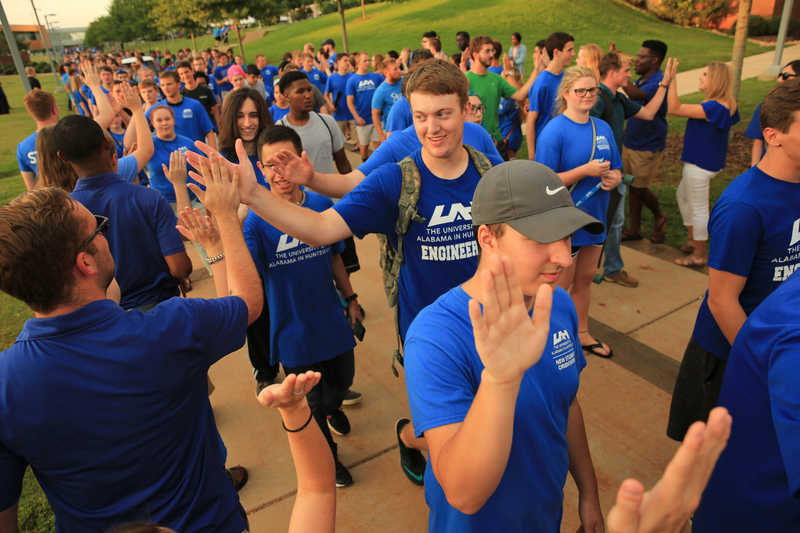 This year, more than 1,000 freshmen marched en masse to the campus greenway to officially commemorate their entry into the university. They were greeted by waiting faculty, applauding upperclassmen, and a program of short talks from the president, provost, and an alumnus. The student government leader administered the university’s student creed and a music faculty member led the singing of alma mater. “Convocation” means a gathering. In academics, convocations are held for a variety of purposes from opening the new academic year to awarding honorary degrees. They are a tradition with roots in the clerical processions of the Roman Catholic Church dating back to the Middle Ages. What I like is that while Fall Convocation nods to the past and rich academic tradition, ours has a definite contemporary bent. It is a strange blend of seriousness set against the casual atmosphere of a summer evening on the campus lawn. 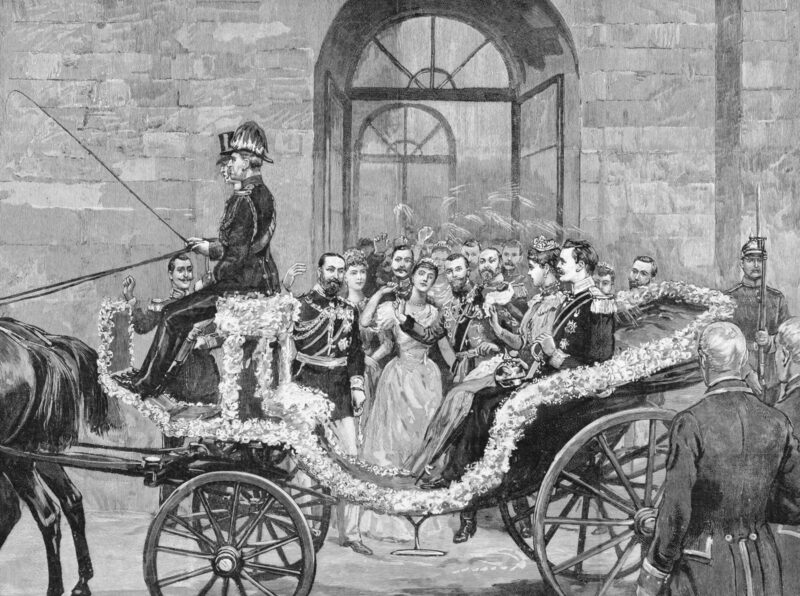 The ceremony’s music is played from a smartphone. Faculty no longer dress in regalia, instead, they wear polo shirts in school colors. Students march in matching tee-shirts specially ordered for the occasion. No solemn procession this, instead, students jubilantly and boisterously process to the site singing, clapping, and cheering along the way. But when the ceremony begins, all is seriousness. Students are silent as their class flag is presented and then listen intently as the president and provost encourage and admonish them to study hard. They earnestly repeat the student creed and work hard to get through the unfamiliar alma mater. As the ceremony ends, another university tradition is observed. Faculty form a double line through which the new students process. Faculty greet them individually and hand them symbolic tassels in our school colors, blue and white, as talismans to remind them of their goal of earning a degree. Four years hence, students will process through the double-line again, at their commencement, where faculty will congratulate them on earning a real tassel—one in the color of their degree. From the “tassel tunnel” students arrive the president’s picnic, their first official meal on campus. They are joined by upperclassmen and the picnic quickly morphs into a party with a live band. The evening is capped by fireworks. Ceremonies are important markers for celebrating key moments in our lives. Weddings, retirements, awards, and funerals mark life’s defining moments. Incorporating the tradition of convocation into the frothy week of freshmen welcome makes a powerful impression that will be remembered long after the foam party or freshman mixer are forgotten. Fall Convocation marks the entry of a student into the next phase of life and plays an important and memorable role in building early and strong bonds that eventually translate into alumni support. As we pass traditional ceremonies along, it is important to remember that to be meaningful, sustained, and treasured, ceremonies must (and will) be reinterpreted by each generation.